I thought it was time for a revamping--hope you like the new look! Love the new look. Love your creative energey. Love everything you are doing. Love you! Hi Kelli! Love the new look! I gave you and award and wrote some gushy stuff about you on my blog. I miss our Embellished Circus swapping days but am so inspired and amazed by your arty success. Hey Kel, would you care to share any how-to info on this piece? I'm thinking it's fabric but the colors are so vibrant I wonder if it's photoshopped, too. Can never get enough color! Yes, I boosted the color in Microsoft Picture It for effect. It's a fabric strip quilt. 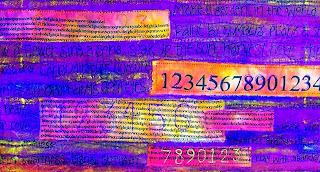 Some of the numbers are printed on the fabric with my inkjet printer and some are sketched with thread.